There was a time when Edwin Evers was ranked No. 1. He’s making a run at getting back there again. 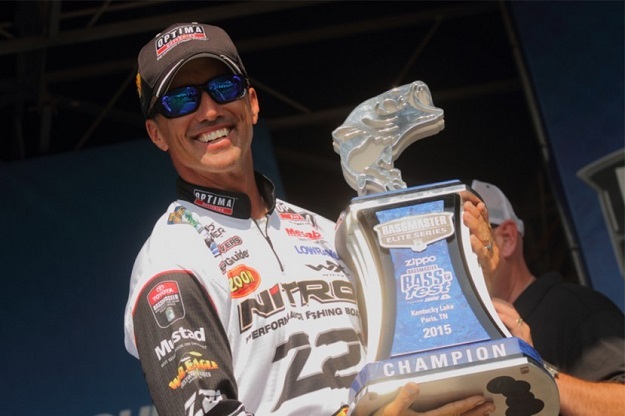 Back in 2013, Evers won the BASS Elite Series event at the Alabama River, and in the process, took over the No. 1 spot in the Pro Ranking. Up until this past weekend, that marked his last Elite Series victory, and the span of events between wins saw some very up-and-down finishes, with him falling outside of the top 50 earlier this spring. However, after his third-place finish at Havasu and his win over the weekend at the Kentucky Lake BASSfest – which also earned him a berth into the Bassmaster Classic on his home lake – Evers is again riding high and climbing the rankings. He was 44th after Havasu, but his victory jumped him all the way to 31st. He still has a ways to go and some bad tournaments to get rid of, but he seems to be regaining his top form. While Evers is trying to get back to the top of the rankings, those top 15 anglers did very little shuffling this week. Aaron Martens and Justin Lucas swapped spots at Nos. 4 and 6, with Keith Combs remaining sandwiched between, but the three of them have been have been playing leap frog most of the season. You have to go all the way to No. 17 to find a real change, with Ott DeFoe making a move into the top 20 and Clifford Pirch and Chris Lane falling out of it.